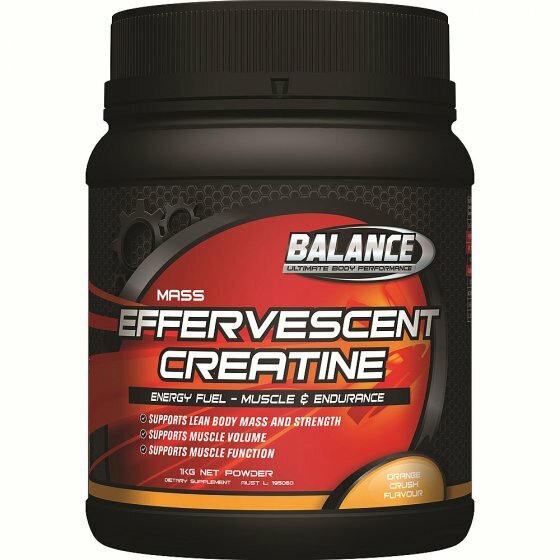 Balance Effervescent Creatine is an advanced creatine supplement with an effervescent catalyst for fast absorption and results. This formula helps support lean muscle tissue, strength and muscle function and assists in muscle recovery in response to increased resistance exercise. Balance Effervescent Creatine may help you maintain a specific level of high intensity intermittent exercise – helping you to perform in peak condition. Creatine is involved in energy metabolism in the muscles and supports the regeneration of ATP (Adenosine Triphosphate), the body’s cellular energy source. This makes creatine essential for instant and sustained energy. Low muscular creatine can lead to reduced muscle power and the onset of fatigue. Creatine assists anabolism allowing protein synthesis to occur. Creatine to support cell energy. Carbohydrates to support the uptake of creatine into muscle cells. Effervescent formula for fast absorption and utilisation. Sodium important for transporting creatine into muscle cells and to replace sodium lost through sweat. Take on an empty stomach 30 minutes before exercise. For the best possible results take one serve – 20g (approximately 1/3 scoop) on an empty stomach 30 minutes before exercise. For those over 82kg, take an additional 1/3 scoop before exercise. Add to 250mL water, stir and serve. The product will settle over time. Shake container before use.